Want results fast? Learn how to create your own custom embroidery designs from the world’s most awarded embroidery digitizer in a private setting… No need to pinch yourself, you’re not dreaming! Take the frustration & confusion out of creating your own custom embroidery designs. Learn the age-old theory behind digitizing that’ll help improve EVERY aspect of your embroidery life. Learn personally from John Deer the world’s most awarded embroidery digitizer. Imagine no longer having to search through thousands of embroidery designs to find the right one or having to pay someone else to create you something custom. Think about how good it would feel to be able to truthfully tell your friends & family: “I made this from scratch.” This 2-day hands on embroidery digitizing workshop is for anyone who wants to create or edit their own custom embroidery designs. This workshop is the ultimate digitizing experience for someone with ANY digitizing skill level & ANY software brand. Our workshops are geared not only to those who are considering digitizing, but also to those who have been digitizing for years. If you’ve ever been to a hands-on software class before you might be skeptical, since often the person who knows the least get the most attention during class, while others are left waiting. Not this time! We run these workshops with very small intimate groups of only 60 students so that John & his team can give special attention to every person who attends. Two weeks prior to class attendees will download a demo version of the software and some basic tutorials about the tools needed for class. Because everyone will come prepared, laptop loaded with the same demo software and knowing where the tools are, you’ll be ready for accelerated learning! Over the past 25 years John has taught well over 10,000 people how to digitize. No matter where you are in your embroidery journey, we’ll give you the tools to take you to the next level. Note: This software is developed for a Windows operating system. There are customers that run this software on their MAC computers when using Parallels. Please contact Apple for more details about the Parallels program. It’s no surprise that a live focused class is the best way to get results fast. In only 2 days you’ll get past the learning curve and on your way towards creating beautiful custom embroidery designs. To start off the workshop and before we dive into the hands-on digitizing experience we’ll cover the fundamentals that go into creating beautiful embroidery. We’ll also cover the basic rules for stitch types and explanations of the common terms used and tools available in every embroidery software program. The best part is that digitizing theory is important for ALL aspects of your machine embroidery. Knowing some theory fundamentals on things like density, push & pull compensation & underlay is key towards the success of any embroidery project. Regardless of the machine brand or software you own, the end results should always be the same… beautiful stitches creating soft embroidery! Getting consistent results begins with a firm grasp of the basics. Explore hooping basics, choosing the right stabilizer, selecting appropriate needles and thread, along with repairing and finishing your embroidery. We will also discuss how to choose the right design and customize it as needed for the fabric you’re working with. Before we dive into the software it is vitally important that a solid foundation is in place. This session will cover the three basic stitch types and their rules. Participants will understand the meaning and variables associated with underlay, push and pull compensation, density and properly pathing an embroidery design. This session will go over and show you how to use all the tools we will need to create the designs coming up. Fun and easy exercises will get you used to using the running stitch, satin stitch and fill stitch tools. We will show you how to successfully create straight and curved objects as well as cover various hot keys and tips associated with “production style” digitizing. With all the rules firmly in place, it’s now time to unleash your creativity. Digitizing needs to be FUN not Frustrating! This exercise will show you how easy it is to implement what you’ve learned so far and know that because you are now following set rules, designs you create don’t need to be a mystery when you stitch them out. Ever wonder why some fonts, even keyboard fonts, stitch better and look cleaner than others? It’s all in how they are digitized and the proper use of underlay and push and pull compensation. One of the best ways to learn proper mapping techniques for digitizing is to learn how to manually create a letter. So that’s what we are going to do: digitize fonts the “old fashioned” way… and don’t worry if you’re brand new or been digitizing for years… I’ll keep you all busy! In this session, we will all be digitizing the same design that will implement all three stitch types. You’ll have the opportunity to use artistic merit and “sketch work” techniques and well as “precision punching” elements within the design. Don’t worry, I’ll give you the entire game plan and be digitizing the same object you are on the large screen. Yes, you needed a break for this one… now that you’ve refuelled your tanks let get back to it! Believe it or not, you might be getting tired right about now. So, I invite you to either sit back and enjoy the ride or jump right back into the driver’s seat… the choice is yours.I’ll show/digitize a whole bunch of quick examples of these and more speciality techniques. The above will be shown as time permits, a class census will be taken to prioritize subject matter. Who is John Deer & What Does He Know About Embroidery Digitizing? John Deer has been the most awarded embroidery digitizer in the world for over two decades now. As a 4th generation embroiderer, John has an extremely unique history in the embroidery digitizing industry as he is one of the last two remaining Schiffli Masters in North America. John learned and apprenticed under Swiss Schiffli Master Digitizers (then known as “punchers”) over 30 years ago in his grandparent’s factory, before computers even entered the digitizing world. In the 1990’s-2000s John owned & ran one of North America’s largest commercial digitizing house, where he did the digitizing for many large corporations including: Disney, Coco-Cola, GM, the NFL, & the NBA (to list a few amongst thousands). John has personally won 30 separate digitizing awards in the commercial industry and wrote the book on digitizing called “Digitizing Made Easy” which has sold over 44,000 copies & is used in Universities across the United States to teach those studying textile. John has produced hundreds of instructional and educational videos, which apply to embroidery enthusiasts of all levels. He has given hundreds of workshops and seminars all over the world & taught well over 100,000 people. Given John’s unique old-school training, family history, and vast embroidery knowledge, he is truly a master embroiderer & digitizer. Learn from the best in the business! 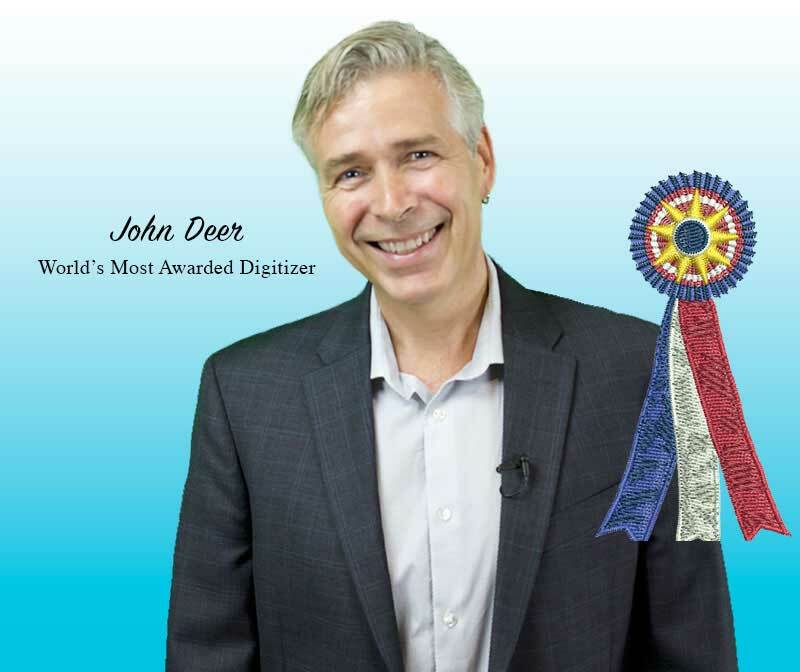 Trusted by thousands of embroiderers & digitizers internationally, your digitizing coach & the world’s most awarded digitizer, John Deer, teaches you in an easy-to-understand language that’ll have you creating your own designs the very first day. "John is a very good teacher. He has a vast knowledge of digitizing and he easily conveys his knowledge in a clear and concise manner." "I am new, very new, to digitizing. This class showed up on my Facebook feed. What the heck, I’ll try it. It was well worth the cost! I feel MUCH more confident to go home and try digitizing projects on my own now!" "I truly enjoyed class – I knew nothing about digitizing. John was very patient with me as I was “that special student” – Highly recommend Hatch & John’s classes- We had a blast!" "Loved the class.. money well spent! John is an amazing instructor who is not only knowledgeable but funny & patient in his teaching. Simple enough for a beginner yet challenging for those with more experience. Thank you for giving us your time & knowledge!" "Very informative, good tips, Johns experience and skill was impressive." "I am new to digitizing and wanted an overview to see if it is something I would want to invest my time in learning. This class gave a wonderful overview of what was involved in creating designs. I have a greater understanding of it, and can’t wait to start! Thanks!" "I have traveled from Phila, PA expressly to attend this workshop. Johns program exceeded my expectations! Terrific balance of practical theory + hands on! So happy I was able to attend!" "I was thrilled to find this class, and very glad that it stood up to my expectations. The class was thorough and well balanced between theory, practice and embroidery tips. I loved it!" "Best theory – based class; not just a push-button experience. John was authorative, kept the class under control. Teaching style was excellent – great job sticking with professional terminology, yet keeping it on an accessible level for the novice." The full 2-day hands-on digitizer’s dream workshop is only $449. Sign up today & receive the early-bird special for only $299. Save $150 today. Hurry! Early-bird discount ends May 1st, 2019. How much money have you wasted buying other people’s embroidery designs or paying someone else to create you something custom? Join us and invest in yourself today to become part of the embroidery elite as an embroidery digitizer… No need to pinch yourself, you’re not dreaming!